Nintendo has really been venturing out of their comfort zone lately. Not only has the famed developer ben revamping its major franchises in recent times – such as was the case with The Legend of Zelda: Breath of the Wild – but they also seem to be more onboard with creating new IPs now than they were just a few short years ago. 2015 saw the release of Splatoon, Nintendo’s quirky take on the multiplayer shooter. And now we have ARMS on the Nintendo Switch, a 3D fighter that once again puts Nintendo’s unique spin on the genre. The schtick here is that the characters in the game all have extendable arms, with the camera faced behind the characters, as opposed to a side-on view as in most fighting games. 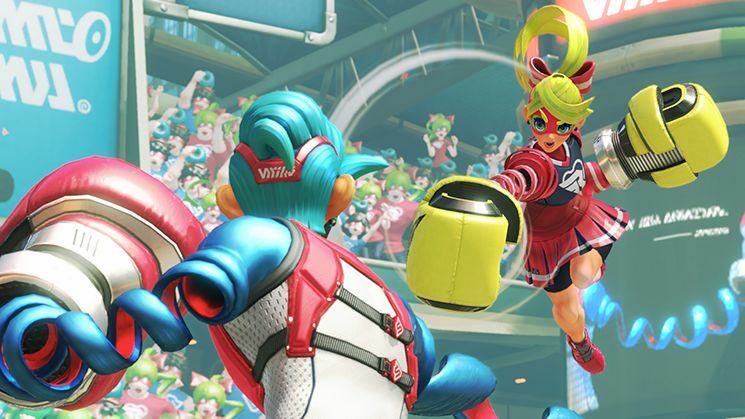 This makes ARMS feel like something of a fighter with third-person shooter elements, as the stretchy arms make battles more distanced than in other games of the genre. ARMS features ten different playable characters, each with their own distinct personalities: Spring Man is the typical super hero-esque main character, while Ninjara – as his name implies – is a ninja-themed fighter. There’s also Byte and Barq, a robot policeman and his robot dog, and Master Mummy, whose extendable arms are his mummy wrappings. There’s also Mechanica, a young human girl who has made a robot suit for herself so she can face her stretchy-limbed opponents in combat; and Kid Cobra, an odd character who seems to be comprised of sporting equipment. My two favorites are Helix, a blob-like experiment, and Twintelle, a famous human actress who uses her extendable hair in place of the other characters’ robot arms. Each character has their own special abilities (Mechanica’s robot suit allows her to hover shortly, and more resistant to knock-back; meanwhile, Byte can use Barq as a jumping platform, with the robot dog also attacking independently from time to time). But what makes ARMS a unique entry in the genre is that it features some interesting character customization, while still retaining a fair competitive edge. All ten characters initially have three different types of arms, and you can equip both of a characters arms with any of the three different types as you choose. However, by earning in-game currency (by playing through the story mode or playing multiplayer), you can play a mini-game that gives you the opportunity to unlock different arms for the different characters. Though the fact that each character eventually shares all the same arms means it takes a little something away from the characters’ uniqueness, it also means that you have the ability to customize characters without completely breaking the game. 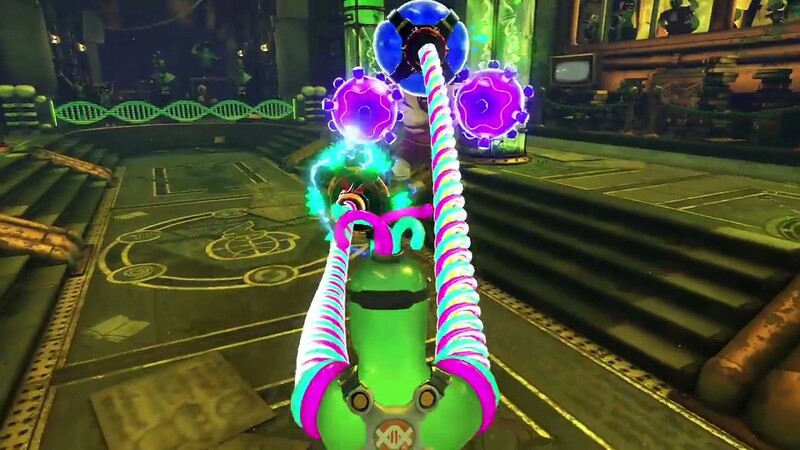 Once you unlock more arms, you can replace any of the characters’ three existing arms as you please. 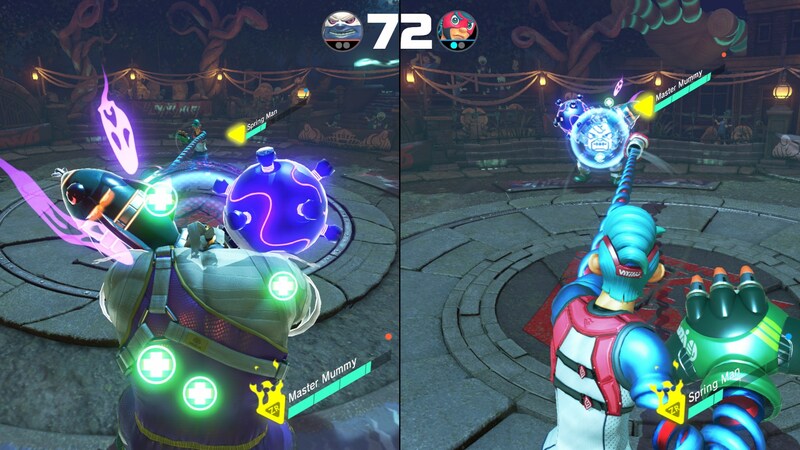 Some arms might have further reach, others might be stronger and block incoming attacks easier, and others still might cause status effects (electricity temporarily stuns arms, while ice shortly freezes an opponent in place). It’s fun just to try out different arm combinations and see which ones you take to. The core gameplay is simple enough, but surprisingly deep. Players can launch each of their arms individually using different button presses or motion controls, (I use the ZL and ZR buttons myself), and using both at once grabs your opponent for a throwing attack. Players can slowly build-up a power meter during a match that, when full, can power-up your character to unleash devastating strikes (if you manage to land the first hit after powering up, that is). ARMS isn’t a fighter filled with intricate combos and vast movesets. You really do only have your two fists, and your grapples. But the depth of the combat comes from combining different arms and figuring out their strengths and weaknesses, as well as learning to best predict your opponents’ movements, so that you don’t throw your arms in vain and leave yourself vulnerable. The gameplay itself is a whole lot of fun, though the learning curve in the controls may be something of a caveat for some players. Thankfully, ARMS provides various control methods, though it may take some time before you find which one is right for you. I’ve noticed a lot of comments praising the motion controlled method, though I personally found it tough to aim my arms with that setup. I first tried using the A and B buttons to throw punches with the more traditional Joycon setup, before I found that the shoulder buttons just felt more intuitive. Your typical matches are one-on-one affairs, but matches between three and four players are also available. There are also two-on-two matches, as well as modes that change up the gameplay. Hoops sees players trying to slam dunk each other in a basketball hoop for points, skillshot has players competing to break the most targets, and V-ball works like a game of volleyball…only the ball explodes if it touches the ground. An additional mode that occurs in some online bouts sees two or three players facing an exceptionally powerful, six-armed AI opponent. The game modes are all fun in their own right, but the core fighting matches definitely stand tall over the others. There is a bit of a downside to the team matches though, with both members of a team being tethered together, and unable to move too far apart from one another. It’s not terrible, but you have to wonder why being linked together is the only way to do team matches. If there’s any other issue with ARMS, it’s simply that the process of unlocking new arms can be a bit tedious. As mentioned, you have to pay in-game currency to play the mini-game just to get the opportunity to unlock more arms. A short game costs 30, a medium-length game costs 100, and a long game costs 200. The problem? Winning an online match (which is surely where you’ll spend most of your time in the game) only nabs you three coins. Sure, you still get a single token even if you lose a multiplayer match, which is generous, but with how expensive it is just to get the opportunity to win more arms, merely getting three tokens for winning a match makes this a long process. It’s true, you can get additional points if you can keep a streak of wins going, but that’s easier said than done when coming in second place in a four-person free-for-all is tantamount to losing, or if the aforementioned six-armed AI manages to withstand the time limit breaks your streak. You always do have the option of replaying the story mode over and over (each playthrough nabs you roughly 40 coins), but that doesn’t exactly make the process less arduous. Perhaps this wouldn’t even be so bad if you had control over which arms you unlock. But the mini-game will reward you with random arms for random characters. This makes the whole process even more tedious than Overwatch’s loot boxes. Still, these are ultimately minor gripes for what is a fun and addicting fighter, and no doubt the next notable franchise from Nintendo. The core gameplay is a lot of fun, and I have yet to experience any technical issues when playing online (with lobbies juggling twenty players and assigning them to different matches at a speedy pace). The characters give the game a fun and colorful personality, the visuals are rich and detailed, and the soundtrack is appropriately boisterous. It may not quite have that same level of freshness that Splatoon had when it arrived in 2015, but ARMS is most assuredly a worthy follow-up to the ink-based shooter as a new, off-the-wall member of the Nintendo family. Wizard Dojo takes a look at Nintendo’s newest IP. Is ARMS the next Splatoon? I have only logged a few hours into the game, enough to beat the main mode on level 4 so I could unlock ranked matches and play a couple of those online. However, I will agree with you on how laborious it is to get new arms. I am loving the game so far, and I am surprised that on the few online matches I played I did not get utterly destroyed (as I am historically terrible when it comes to fighting games). Add my Switch FC: SW-4128-2724-1902. Thanks! ARMS is a really great game. I look forward to playing with you. We should set up some time to play together. Happy to hear you got a Switch! I won’t get Arms till I can afford another set of bloody Joy-Cons! That being said, I’m glad it’s fun, and it seems like Nintendo plans to keep supporting it with new content long after launch. Thanks for the comment, as always. You know, I just brought my Switch and ARMS to my brother’s house yesterday, and played it with him and some friends, which gave me a greater appreciation for it. I’m really trying to stop changing scores, but I may just have to bump ARMS up to an 8.5 in the future. ARMS local multiplayer is arguably the best part! It’s so frantic but it’s honestly some of the most unadulterated fun I’ve had in years. While I loved the nuance of Splatoon, it certainly lacked that local multiplayer suite which I thought hurt the overall experience, so I’m glad that Nintendo double-downed the local multiplayer with ARMS, even including split-screen online play!